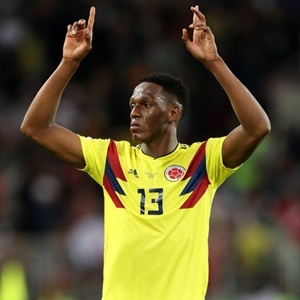 Cape Town - Marco Silva refused to criticise Colombia manager Carlos Queiroz after defender Yerry Mina sustained a ‘serious’ hamstring injury. Mina was injured in Colombia’s 2-1 friendly defeat to South Korea on Tuesday, having also featured in Friday’s 1-0 win over Japan. The 24-year-old, no stranger to setbacks this season, is facing another spell on the sidelines, and, though Silva could not give a firm timetable for his return, he said he was sure Mina would play again this season. Silva revealed he had told his fellow Portuguese Queiroz that the defender was not fit enough to play in both games for his national team over the break. "We knew it could be a risk for him to play the two matches, it was something in our communication with the national team," Silva said. "We cannot control it, it’s their decision of course but we tried to advise them. "It was always a risk for him to play in a short period the two games. "They decided and unfortunately for us and for Yerry he took the injury." Asked he was angry or unhappy with Queiroz’s decision, Silva said: "It’s not a matter of being unhappy. "My colleague is also Portuguese and we had this communication, but of course he decided the best thing for the national team was to always have the best players. "Unfortunately for us and for Mina he has to stop again." Just how the long the big-money signing from Barcelona faces out remains to be seen. "It’s not for the season," Silva said. "Let’s see how many weeks he will be. "Now is not the right moment to say how long but we expect to see Mina again here soon training and playing in our blue shirt." Mina will miss Saturday’s trip to West Ham – a key fixture for Everton against a side two points above them in the congested mid-table of the Premier League.